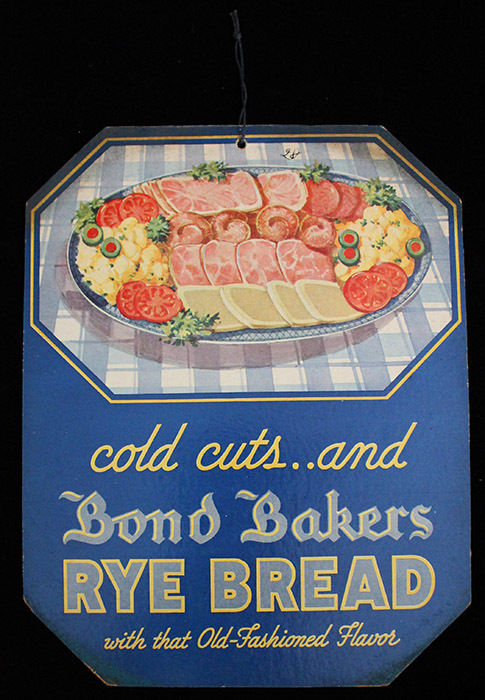 ARTIFACT: Great 1920�s Early Bond Bakers Rye Bread two-sided advertising lithograph on card stock sign. The sign is blue and features an image of a platter of meats and such on a blue and white plaid table cloth and below it reads: �COLD CUTS..AND BOND BAKERS RYE BREAD WITH THE OLD FASHIONED FLAVOR� in yellow and blue block letters. ATTACHMENT: String at top center for hanging. CONDITION: 8- (Very Fine�Excellent): The sign shows minor to moderate wear and minor discoloring to the top of one side, overall excellent condition.